We have been so proud to announce the arrival of our new fab comic Bloke’s Progress, the combined version of three fabulous comics written by Kevin Jackson and illustrated by Hunt Emerson. Both attended the Lakes International Comic Art Festival in October (with, of course, Bloke’s Progress). 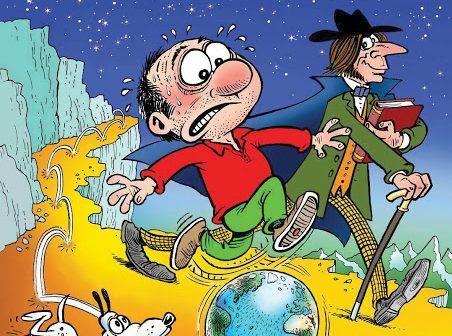 During the Festival, it was announced that Hunt Emerson was the winner of the Sergio Aragonés International Award for Excellence in Comic Art for 2018. Hunt, who is highly regarded internationally for his work as a graphic novelist, and as a cartoonist for a variety of magazines including Fortean Times and Beano, was announced as winner at the opening ceremony of the Lakes International Comic Art Festival in Kendal, Cumbria. The award was established last year by The National Cartoonists Society, in partnership with the Lakes International Comic Art Festival. The honour is presented annually to an exceptional comic artist, animator, or cartoonist. Copies of Bloke’s Progress are available to purchase from Brantwood bookshop at a price of £12.99. “In 2005 and 2008 Kevin Jackson and myself, with the Ruskin Foundation, produced two comic books – HOW TO BE RICH and HOW TO SEE, both for limited distribution in the North West of England. There was always intended to be a third volume, HOW TO WORK, and now the Ruskin Foundation have the funds to realise it. Knockabout, with the Foundation, are publishing all three comics in one 120 page volume, BLOKE’S PROGRESS, to be released in April to coincide with a major exhibition entitled WORK at Brantwood (Cumbria), the Ruskin Foundation’s headquarters.